We develop a probabilistic variant of k-anonymous microaggregation which we term p-probabilistic resorting to a statistical model of respondent participation in order to aggregate quasi-identifiers in such a manner that k-anonymity is concordantly enforced with a parametric probabilistic guarantee. Succinctly owing the possibility that some respondents may not finally participate, sufficiently larger cells are created striving to satisfy k-anonymity with probability at least p. The microaggregation function is designed before the respondents submit their confidential data. More precisely, a specification of the function is sent to them which they may verify and apply to their quasi-identifying demographic variables prior to submitting the microaggregated data along with the confidential attributes to an authorized repository. We propose a number of metrics to assess the performance of our probabilistic approach in terms of anonymity and distortion which we proceed to investigate theoretically in depth and empirically with synthetic and standardized data. We stress that in addition to constituting a functional extension of traditional microaggregation, thereby broadening its applicability to the anonymization of statistical databases in a wide variety of contexts, the relaxation of trust assumptions is arguably expected to have a considerable impact on user acceptance and ultimately on data utility through mere availability. 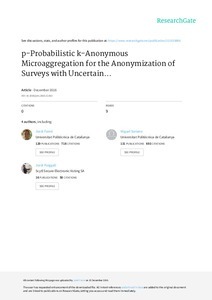 Rebollo-Monedero, D., Forne, J., Soriano, M., Puiggalí, J. p-probabilistic k-anonymous microaggregation for the anonymization of surveys with uncertain participation. "Information sciences", 13 Desembre 2016, vol. 382-383, p. 388-414.